The year is 1878. Tessa Gray descends into London's dark supernatural underworld in search of her missing brother. She soon discovers that her only allies are the demon-slaying Shadowhunters --- including Will and Jem, the mysterious boys she is attracted to. Soon they find themselves up against the Pandemonium Club, a secret organization of vampires, demons, warlocks, and humans. Equipped with a magical army of unstoppable clockwork creatures, the Club is out to rule the British Empire, and only Tessa and her allies can stop them . . .
Just last year, I decided to give Cassandra Clare's The Mortal Instruments series a chance, and the series definitely started off on a high note for me. However, I fell out of interest around the third or fourth book and never finished the series. 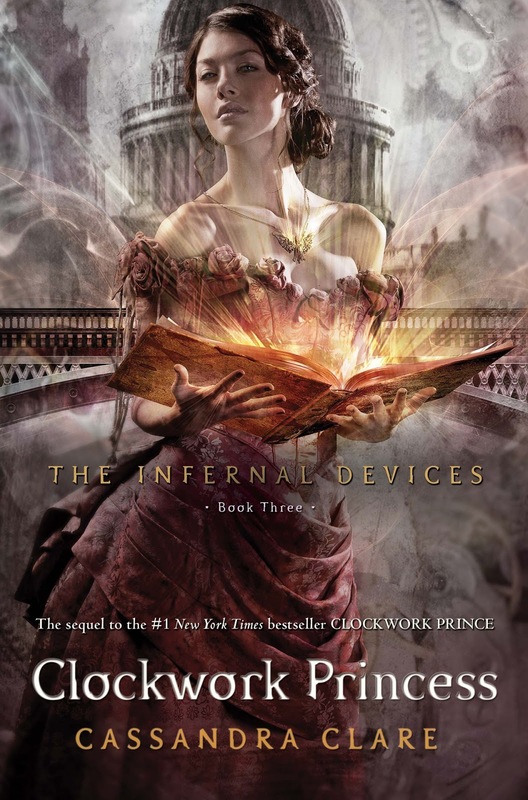 For this reason, I wasn't sure whether or not I would try Clare's prequel series, The Infernal Devices, but the high praise from her fans eventually persuaded me. Quite unfortunately, I remain rather unimpressed and uninterested with the Shadowhunter world, but overall, I did enjoy Clockwork Angel. I know that The Infernal Devices and The Mortal Instruments series take place in the same world and should therefore draw parallels. However, the likeness between the two were too similar for my taste. It felt as if Clare recycled her old characters, slapped on new names, changed the time period, slightly tweaked the storyline, and called her product something new. I felt as if I was reading the exact same story a second time. And since I eventually became disinterested with The Mortal Instruments series, well . . . that didn't help Clockwork Angel's case. I simply do not understand the fawning over certain characters (cough, William Herondale, cough), but I realize Clockwork Angel is only the first book in the series. And for that reason, I will give the series time before drawing further judgement. I am excited to see how Clare's characters and their interwoven relationships will develop in the next two books. The storyline itself didn't captivate me. I don't know why because the events were definitely exciting and action-packed, but none of Clare's plot points took me by surprise. 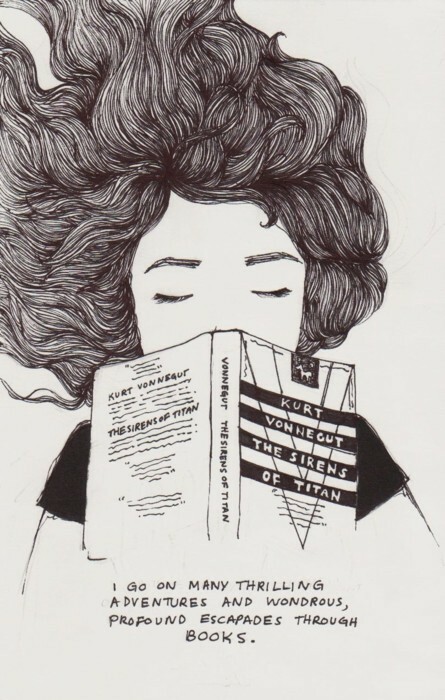 Still, I am intrigued enough to continue on with Clockwork Prince. 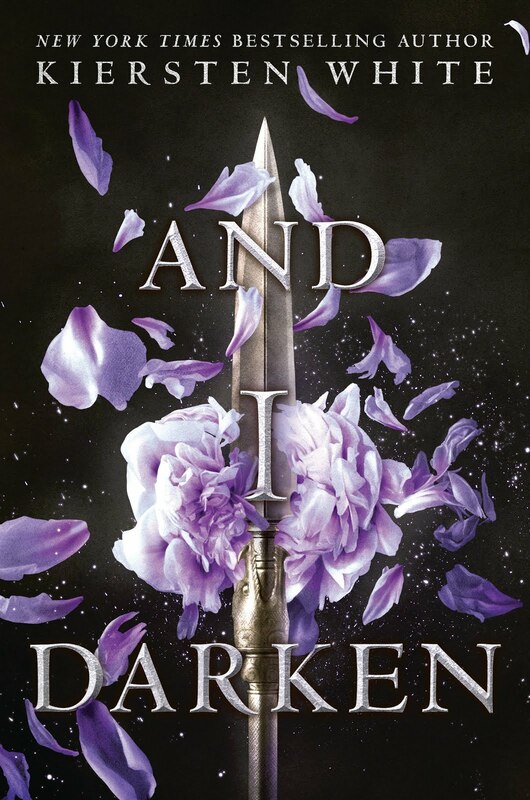 With the help of the handsome, self-destructive Will and the fiercely devoted Jem, Tessa discovers that the Magister’s war on the Shadowhunters is deeply personal. To unravel the secrets of the past, the trio journeys from mist-shrouded Yorkshire to a manor house that holds untold horrors, from the slums of London to an enchanted ballroom where Tessa discovers that the truth of her parentage is more sinister than she had imagined. When they encounter a clockwork demon bearing a warning for Will, they realize that the Magister himself knows their every move—and that one of their own has betrayed them. Clockwork Prince was without a doubt, my favorite book of the trilogy. I said I wasn't hooked with Clockwork Angel, but Clockwork Prince forced me to retract that statement. I read this entire book over the span of one or two days. In this second installment we get all of that action, drama, and romance readers love. The love triangle brewing in book one takes the on the front role in Clockwork Prince. And thankfully, it's not one of those annoying, overdone, sickening love triangles. 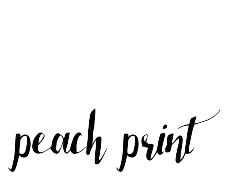 I think all readers will agree -- it's considerably well executed. We get to know Clare's characters so much better! I loved reading their humorous banter. And yes, I said I didn't get the hype over Will Herondale, but . . . I do understand him a little better now. Now onto book three . . .
Tessa Gray should be happy -- aren't all brides happy? Yet as she prepares for her wedding, a net of shadows begins to tighten around the Shadowhunters of the London Institute. 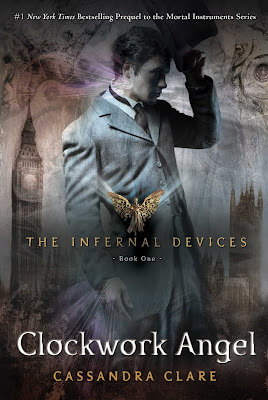 A new demon appears, one linked by blood and secrecy to mortmain, the man who plans to use his army of pitiless automatons, the Infernal Devices, to destroy the Shadowhunters. Mortmain needs only one last item to complete his plan. He needs Tessa. And Jem and Will, the boys who lay equal claim to Tessa's heart, will do anything to save her. I wanted to LOVE this series, but I just . . . didn't. 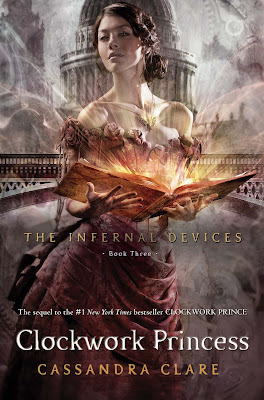 I liked the Infernal Devices, but after reading the final book, I can't say I'm attached or invested with the series. Clockwork Princess was another okay book for me. It was better than the first, but not better than the second. After a while, I found the drama to be very trivial. To me, Clockwork Princess turned into a soap opera. I liked the love triangle in Clockwork Prince, but I found it a bit ridiculous in the final book . . . However, I can say the ending was full of action and a number of plot twists and surprises. Clare was able to bring the series to a close in an admirable way. My only problem was everything worked out a bit too well. All characters seemed to have a relatively happy ending, and at times the plot twists became rather absurd. I definitely understand why Clare has such a big following, but unfortunately, the Shadowhunter world just isn't for me. Aww Im so glad that you continued the series even though you didn't give the first book such a high rating. It definitely did get better with each book and that ending totally killed me omg! I died at the end haha. But definitely this series has such a large part in my heart and I definitely wish she wrote more about that ending. Even though you the Shadowhunter world might not be for you, I'm glad you gave the Infernal Devices a chance. 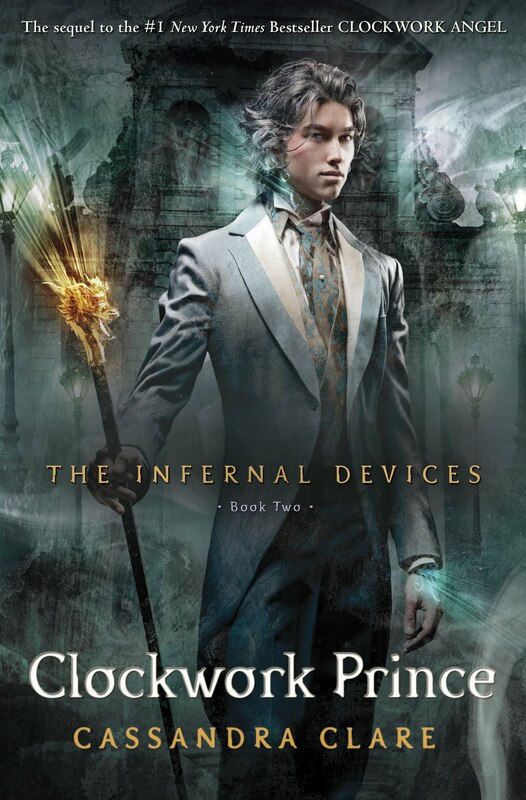 Honestly I liked the Infernal Devices a lot more then the Mortal Instruments.. since -cough cough I might have read this series first cough-, because in my opinion this book was definetly way different from TMI, it the characters were very easy to form an attachment to, and the storyline was amazing. Yeah, I think most people agree: The Infernal Devices > The Mortal Instruments! At first I didn't understand Will Herondale, but my love for him grew. He's not quite a Sam Cortland for me, but at least I now understand why everyone loves him so much. I couldn't bring myself to read the (very) end of the book! I started reading the Epilogue and then I was like "nope!!" Ahaha . . . like you said, I wanted to leave off on a good note. I'm sorry you don't enjoy this world as much as others do! I marathoned every book in the shadowhunter chronicles about a year and a half ago, and I enjoyed them loads at the time. I'm not sure I would enjoy them as much now though, because there's so much hype! I liked TID much more than TMI over all, but I would recommend continuing with TMI because the last book, City of Heavenly Fire, is amazing. I loved the Infernal Devices more than the Mortal Instruments, and I had really mixed feelings after the last book, but in the end I came to enjoy it after time passed. I feel like Cassandra tried to do too much with what she had, that it was kind of a cop-out, but all in all I liked the series. Sorry you didn't like this one! I feel so bad for not LOVING this series like everyone else, but I'm glad to hear you enjoyed the TMI books! Thanks so much for the comment! :( I'm sorry you didn't enjoy this series. I loved it so much, but I understand that this series is not for everyone. Clockwork Angel is a little in the beginning, but it definitely picks up. I actually did enjoy moments from TMI, but for some reason I'm just not a fan. However I'm glad you quite liked the TMI series! :-) Thank you for the comment. I am so with you- I don't think that Shadowhunters and I are meant to be. I forced myself to finish TMI, after I (again, just like you) got SO bored after book 3. And I wish I hadn't bothered. There was just nothing new! And I have heard that this series is better but... I don't know if I can do more Shadowhunters, honestly. Le sigh, I think I will pass for now. Especially since we had such similar feelings to TMI! Great reviews, sorry that these weren't a huge hit! Shannon, I can't tell you how relieved I am to hear this . . . finally, someone who agrees with me! I thought I was the only person in the entire world who didn't love this series. And yeah, TID is pretty similar to TMI, but I guess that's to be expected. Thanks so much for the comment! I love the cover, and I am most definitely intrigued. Great pick! Have a wonderful day. I'm glad you liked this one! I've been hearing nothing but good things! Thanks for sharing the cover - I like it! This sounds like an intriguing read.